March is a rough month for most MMO released in 2012 such as Guild Wars 2, Tera, and WildStar(although this one was launched in 2014). These games have been losing popularity for quite a while and have a hard time regaining their number of players. On the other hand, it’s a great month for FFXIV because of its recent major patch update. 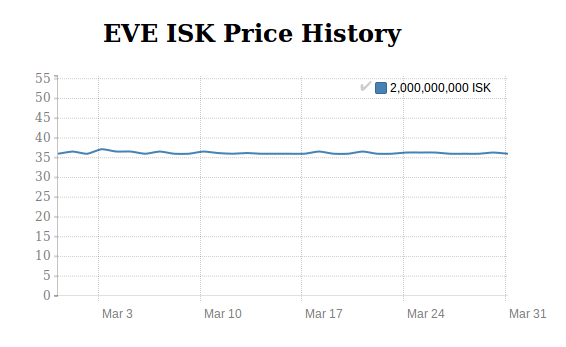 Unlike other games in our roster, EVE Online ISK price is almost unchanging at all for the whole month. Since there was no major update on the game, ArcheAge Gold price was slightly lower in March than in February as expected in our last month RMT roundup. However, it was only a minimal decrease. Throughout the month, ArcheAge gold price had been regularly changing for around 10%. The price usually went up on weekends and became lessen again on weekdays. There shouldn’t be any more update of the game during April considering that it just released a major patch in January. ArcheAge gold price is expected to stay in the range of ~$30 USD per 2,000 gold in April. The cheapest Archege gold was on March 27, 2016, which is 2,000 ArcheAge gold for (US) $29.08 and the most expensive was on March 04, 2016, for $34.00. The discrepancy rate was only at 16.92%. The situation of SWTOR Credits price was slightly better than Guild Wars 2 this month. 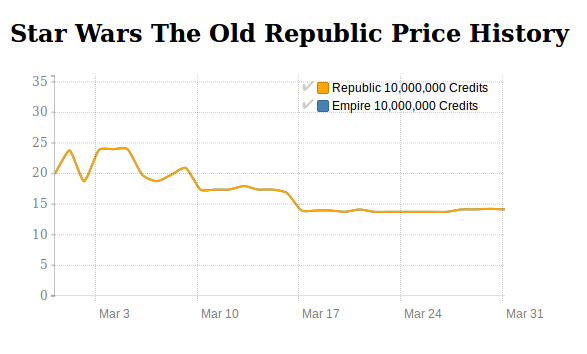 Although it similarly suffered from the decline of in-game currency price since the first few weeks of the month, Star Wars the Old Republic Credits price just stopped after it reached a certain point of ~$4USD per 10m Credits. And it should not be lower than this range unless a major issue occurs. In addition, SWTOR is going to release a new episode called “Knights of the Fallen Empire” on April 7, 2016. Although the update isn’t that big, it should at least slightly increase SWTOR Credits price. The cheapest was on March 20, 2016 which is 10mn SWTOR US Credits for $13.75 and the most expensive was on March 4, 2016 for $23.98. The declined rate was as significant as 71.65%. Tera had been, again, running a lot of marketing campaign this month from weekend sales, decreased subscription price, to randomly gave bonus to players. All of the efforts went quite well causing its gold price to stay in the range of $25.98 USD per 20,000gold for almost the whole month instead of starting to decline. However, it had a sudden 15% drop for a day once in a while from an unknown reason. Enmasse is expected to keep releasing new events in the game continuously in April causing Tera Gold price to be in this range. The cheapest was on March 17, 2016 which is 20,000 Tera Gold for $21.59 and the most expensive was on March 15, 2016 for $25.98. It was 20.33% different. Although the situation for WildStar Online in March was better than February, it was still rough for WildStar Gold RMT market. The price had been fluctuated on the first 3 weeks after stopped on March two weeks. Circumstance between Tera and WildStar is quite similar. Their developers have been releasing a lot of campaign in order to keep gamers staying. However, these small events cannot create a breakthrough causing the RMT price to be increased that much. WildStar Gold is predicted to be slightly lower in April. 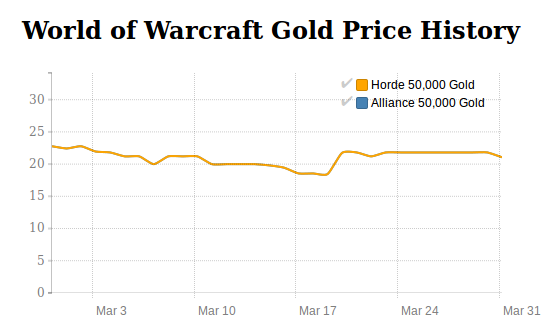 The cheapest was on March 03, 2016 which is 5,000 gold for $34.95 and the most expensive was on March 10, 2016 for $44.08. The discrepancy rate is at 26.12%.